Liam Walsh, 21-0, took a crack at the IBF junior lightweight title when he took on American champ Gervanta Davis, 17-0, in a sold out Copper Box arena in London. Smith showed some nice range in the first, then refused to sit down in his corner. Davis, however, remained patient throughout the second, exuding terrific confidence in the process. It may have been a somewhat even round in the eyes of viewers and judges, but Davis acted as if he was completely in control. Perhaps he knew what would happen, for in the third he put his man down after several seconds of firing heavy shots. The Englishman got up, but that was polished off a few sharp punches later, when referee Michael Alexander wisely stopped the bout. Showtime, which broadcast the bout, then went across the Atlantic to showcase a card live from the MGM National Harbor in Maryland. First up was Rances Barthelemy, the 25-0 junior welterweight from Vegas by way of Cuba. Barthelemy’s opponent was 21-1 Belarus native Kiryl Relikh. Barthelemy was well regarded walking into the fight, but Relikh had his man in trouble after dropping Barthelemy in round five. To add to the suspense, Barthelemy dropped Relikh three rounds later. It was an interesting, competitive bout and there was much unhappiness when Barthlemy ended up winning by UD via some very wide scores. The controversy was followed up by super middleweight Andre Dirrell, 25-2 facing Jose Uzcategui, 26-1, for the chance to face multi-titlist James DeGale (for Dirrell, that fight would be a rematch). The first round wasn’t overly eventful, but Dirrell was jostled by Uzcategui in the second. Indeed, it looked like the man might go down. Dirrell, however, was able to survive the round. What’s more, he was able to work effectively at points, but Uzcategui remained aggressive. 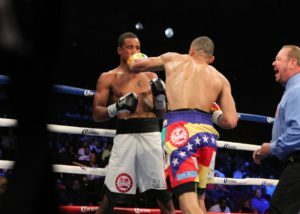 Dirrell came back in the third by employing a very impressive jab and slick defense. By the fourth, Dirrell was in fine form, jabbing and keeping away from his foe proficiently. And Dirrell continued to keep Uzcategui from taking complete control throughout the middle of the fight. Then, at the end of the 8th, Dirrell was hammered after the bell. Referee Bill Clancy subsequently disqualified Uzcategui. Afterward, a rumble erupted and at least one member of Dirrell’s team took shots at Uzcategui. Word came out that Maryland police were looking for Dirrell’s uncle while essentially keeping Uzcategui in protective custody. It was also reported that Dirrell’s brother may have become violent with a commission member. An ugly scene all around. It was time for the main event. Featherweight Gary Russell, 27-1, looked to hop back into the public consciousness by looking impressive against 25-2 Oscar Escandon. It was Russell’s second defense of his WBC world title and he had the comfort of fighting within his home state of Maryland. Columbia’s Escandon, however, was planning to make the most of this opportunity. Russell, one of the sports’ more impressive slicksters, may have told the tale in the first round, but Escandon was able to get in his shots. Both men traded shots effectively in the second, making it a fast paced, close quarters round. Russell, however, was able to drop his man in the third. Escandon got to his feet, but Russell was finding his mark and landing with noticeable power. By the end of the round, Russell was landing hard and often enough to make one wonder if the man would run out of gas should Escandon refuse to be stopped. Russell never had to worry about it. For he stopped Escandon in round seven after what was an exciting, high octane bout. Escandon was a true warrior, but referee Harvey Dock had seen enough of Russell’s power shots landing clean. To his credit, Russell apologized for the wild antics of the evening – even though they had nothing to him. Boxing could use more of that kind of class.